According to the iTunes rating system, if an app is deemed to have prolonged graphic or sadistic violence, the app will be deemed inappropriate for the iTunes store and will be removed. You might think that this measure would protect your child from exposure to overly graphic or sadistic violence, but this is unfortunately not always the case. How is Prolonged Graphic or Sadistic Realistic Violence Defined? First of all, you may find that you have a different definition of what makes violence prolonged, graphic and/or sadistic than iTunes does. For example, realistic violence is allowed in the store, depending on how frequent and/or intense the content, images, and videos in the app are. Many critics have pointed out that there is a gray area here and that some people might view “intense realistic violence” as sadistic or graphic. Unfortunately, you cannot count on the App Store review system to completely protect your children from seeing this kind of content. However, as they say, knowing is half the battle, and you have resources at your fingertips to help you determine whether or not an app is safe for your child. First of all, when you look at an app that your child wants to download, look it up in our app directory. If you see an entry for high “frequent/intense realistic violence”, you might want to take a closer look at how it portrays this violence and if you believe that it’s closer to prolonged graphic or sadistic realistic violence. Now, these steps protect you from imagery and content that may be written into an app, but they don’t necessarily protect against risk of exposure to prolonged graphic or realistic violence from other users. Much like other risk factors, this risk increases a great deal if the app allows private messaging, especially multimedia messaging. If another user can send your child inappropriate, violent content, then you may need to consider the risk level that this app presents. In doing so, you should take into account the app’s genre. If it’s an app for people who love classic cartoons, it’s not going to be as likely to attract people who want to share sadistic imagery or content. On the other hand, horror-themed apps that allow private messaging may be more dangerous. If you consider the violence portrayed in an app to be graphic, sadistic, or prolonged, you should talk to your kids about why they aren’t allowed to use the app. You can talk to them about how this kind of imagery is too scary for kids and/or that it shows very bad situations in an entertaining light. The more open you are about why the content is inappropriate, the less likely your kids will be to try to sneak behind your back and use the app anyway. How Can Violent Images Damage Children? Why should you be so vigilant about limiting your children’s exposure to graphic or sadistic violence? Look at the image featured in this article. 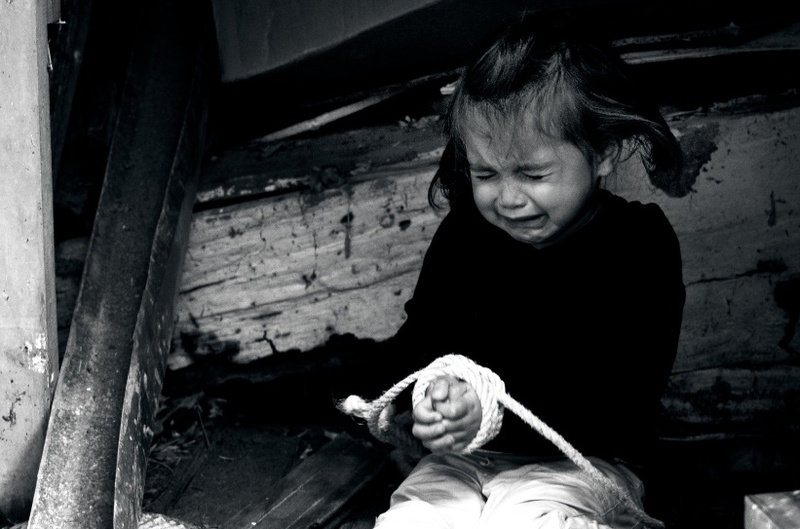 What do you feel when you see a small girl with her hands tied, crying, and apparently hopeless? Though you know that the image is not real, you feel as though it is. You experience vicarious trauma just by witnessing an image of violence. Now, with that in mind, consider seeing this kind of imagery as a child. Children’s minds are still developing, and they have not developed the coping tools that adults have for seeing and dealing with these kinds of intensely violent images, videos and content. Regular exposure – say, through a mobile app – to graphic violence can do serious damage to a child’s psychological development. So, if you suspect that a mobile app has a high risk of exposing your kids to prolonged graphic or sadistic realistic violence, you should talk to your child about violent images and how they use the app. If you believe they are at risk for seeing prolonged graphic violence, then you should restrict them from using the app. Again, your definition of graphic and sadistic violence may differ from the definition that iTunes uses when allowing or blocking apps from the App Store, but with these tools, you can make the right call for your kids.